So what’s the story? Does coconut oil cause acne, or is it an acne miracle? I know one thing for sure – that coconut oil is fantastic to ingest internally to help with your acne and overall health. Coconut oil contains lauric acid, capric acid and caprylic acid, which have antimicrobial, antioxidant, antifungal, and antibacterial properties. It can also help to kill yeast and parasites which improves digestion, and it can also boost your immune system to fight infections! Coconut Oil is Great for Acne If Used Internally! My favourite way to use coconut oil is in my cooking. 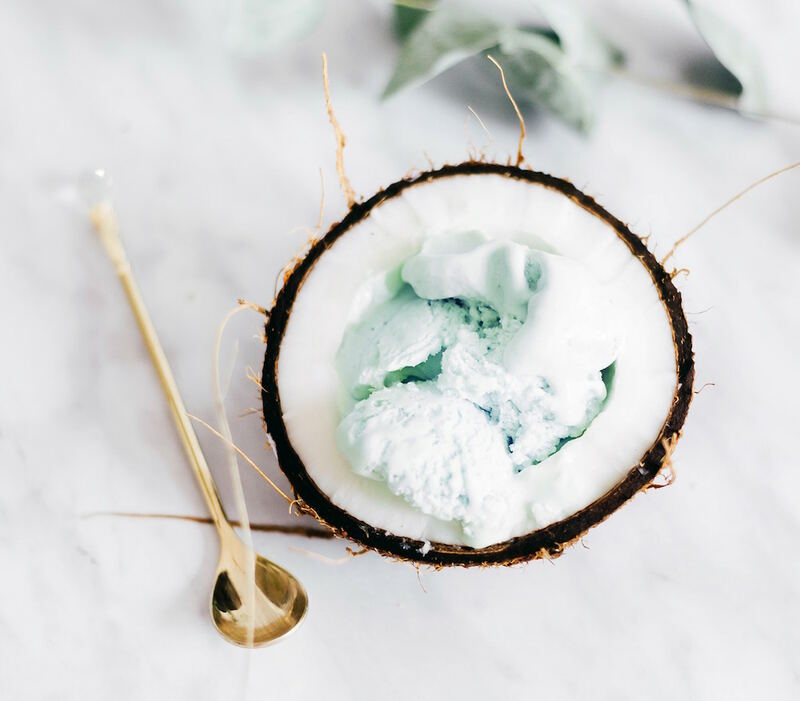 Instead of olive oil, canola oil, or any other random oil, it’s best to use coconut oil – not just because of the health properties, but because it has a very high smoke point. Many oils (including olive oil) mutate and turn toxic when they are heated to medium or high heats. You don’t want that – damaged, toxic oils can have a very adverse affect on your skin. However, coconut oil is more stable and can withstand higher heat, leaving you with a much healthier meal. Okay, great. But what about using it directly on the skin? I’ve been getting a nutty amount of questions lately in regard to using coconut oil on the face. This is because there are many a review out there on the internet RAVING about how awesome coconut oil is for their skin. It helps to clear acne, heal wounds, and moisturize their skin to a silky state. So people want to know from me… is it legit? Should they use it? To be honest… the answer is NO! I would definitely have no problem using it as a moisturizer for my body, but I’ve never used it on my face. Frankly, I’m too scared to try it. While many people love using coconut oil topically, the fact is that it’s very comedogenic (meaning pore clogging). On a scale of one to five, with five being the most comedogenic, coconut oil is a four! One of the most concrete reasons I’m too freaked out to give it a try is because of some articles that Fran from High on Health posted a while ago about her experiences with coconut oil. She wrote a post telling people that she was using coconut oil on her face and that it was going well, and that she LOVED IT! But then she later does a follow up post in which she says it triggered quite a breakout, all her pores became clogged, and it took her skin months to recover. She even calls it a ‘nightmare’. I’ve actually heard this story a fair few times from others as well. Then again, no two people’s skin or bodies are exactly alike. No matter what the product or ingredient (or food for that matter), some will love it, and there will always be people out who happened to have had the worst experience of their life with it. The thing with coconut oil though is that it’s probably fine… IF you aren’t acne prone, which is why you hear so many wonderful things about it being used a moisturizer. If you are acne prone (and I assume you are if you are reading my site), then you might have luck with it, but I’d stay away. And don’t get me wrong… I love using oils in my skin care, just not coconut oil. Why take the chance? There are so many that are non-comedogenic and highly beneficial for acne, like hemp seed oil or argan oil. Check out my article on the best oils to use if you’re acne prone! However, if you are a braver soul than I and would like to give it a try anyway, absolutely make sure that you are using unrefined, organic, virgin coconut oil. Then if it clogs your pores and breaks you out, you will know it wasn’t the cheap quality or pesticides causing you issues. What do you think? Have you tried coconut oil on your face? Did you love it? Hate it? If not, would you try it? Or have I freaked you out enough to not touch it? If you’ve googled or youtubed anything to do with curing acne naturally, you’ve probably come across redheaded Australian Fran Kerr and her website about holistic skin care, High on Health. Fran’s a good egg. She was one of many inspirations for me when I was trying to clear my own acne, and I think that we have a lot in common. If you haven’t checked out her site, it’s a very comprehensive resource for natural skin care and clearing acne, so it’s definitely worth a look. She’s a very sincere and genuine person. 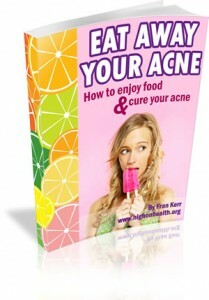 Fran has her own ebook that she’s written called ‘Eat Away Your Acne – How to Enjoy Food & Cure Your Acne’. It retails for $27 but recently she put it on special for $5 (the deal is over now, sorry). I couldn’t help myself, so I decided to grab it and see what Fran had to say on the subject so that I could share it with you. I wasn’t sure what to expect. What kind of diet advice was she going to give? Was it anything like my own opinion? First of all, she begins by letting you know what acne is, how it’s formed, and what causes inflammation. She then gets into food sensitivities, hormones, digestion, good and bad fats, refined foods, sugars, milk, and some other examples of foods you should eat and foods you should avoid. Then you get some ideas for healthy snacks and meal ideas, a few suggestions for external skin care, and a note on how she feels about doctors and naturopaths. The book gets wrapped up there. It was a pretty good beginner’s guide to healthy eating and what I would mostly suggest myself. Does it cover every detail of natural nutrition in depth? No, but if you are brand spankin’ new to healthier eating, this book is definitely a good start. She doesn’t recommend one rigid diet regime and leaves your options open to experimentation and self discovery. One of the reasons Eat Away Your Acne doesn’t cover everything is because it’s very short at only 44 pages long. I believe Fran has a lot more knowledge up her sleeve, but didn’t want to overwhelm people new to the nutrition game… because believe me, there’s a lot to know and it’s easy to get overwhelmed. Since being overwhelmed leads to stress which may lead to acne, I can’t really blame her there! Most importantly… will it really cure your acne? That depends on how bad your diet is and whether or not that is the weakest link when it comes to your skin. If you’ve read through my site, you’ll know that I feel there is much more to curing your acne than just diet. Fran knows this too, but like I said… she didn’t want to overwhelm anyone. If you’d like to purchase Fran Kerr’s book, Eat Away Your Acne, you can click here to give it a whirl.